I’ve long had a suspicion that, just as knowledge management generally isn’t concerned with knowledge, so “business intelligence” is not really concerned with intelligence. Rather, in both cases, they’re primarily concerned with the management of information; the hard “knowledge” or “intelligence” part is usually left for the user. This is not to deny that knowledge management and business intelligence are useful; of course they are, in their own ways. It is just that there is a gap between their somewhat grand self-designations and the somewhat more mundane reality of what they do. At BI Questions Blog, there is a video of Timo Elliott giving an interesting overview of business intelligence (BI) and what contemporary BI suites such as Business Objects can deliver in this area. It is quite an eye-opener in many ways, and well worth watching. It gives a nice opportunity to elaborate the point about BI skipping over the “I” or intelligence part. First, you need to be able to tame information chaos. You’ve got lots of different information in lots of different systems, structured data, unstructured data, documents, emails, there’s the web out there; so bringing all that information into one coherent structure so you can start doing something with it. Of course having information alone is useless; you need to turn that into insight. You need tools that actually let you look around and drill into the data and report it out to all of the people in the information who need it. The third thing you need to do is turn that insight into action. Looking at a report is useless. Something has to change in the business in order to get any value. Information has to be actionable. So to help you turn insight into action we provide a suite of business applications, in particular for the office of finance, to help you with financial planning, budgeting, consolidation, profitability and cost analysis – a whole suite of tools that really let you start doing things with the information. But there’s something missing from this picture. In non-trivial or non-routine cases, you can’t (or shouldn’t) skip directly from insight to action. Insight, in TE’s description of it, appears to be a richer, more synthesized, more accessible form of information; it is what you’ve got when you’ve used their tools to “look around and drill into the data and report it out.” Between insight, in this sense, and action there have to be processes of assessing, deliberating, integrating, weighing, and choosing – in short, there has to be decision. Decision making is the crucial bridge between information (even quality information, i.e. insight) and action. Impressive! 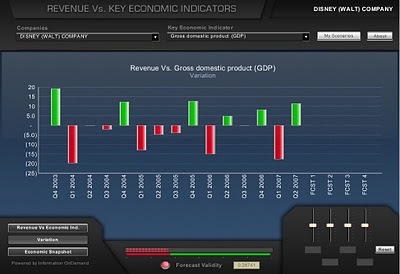 If you look closely, it seems that Disney does poorly in Q1 each year. It certainly does seem that we’ve instantly got some greater insight. But what follows from this insight? What should Disney do? Close down in Q1 each year? Increase advertising in Q1 – or Q4? Lower prices? Hire more staff? Fire more staff? Nothing? Before any action, you’d have to decide which action was most appropriate in the circumstances. The insight we obtained (and no doubt numerous others we could get from our wonderful BI suite) would surely help. But insights, no matter how penetrating or how numerous, don’t dictate any particular decision. The decision is generally made through a deliberative, usually collaborative process in which insights are translated into arguments and arguments are assessed and weighed. This deliberative decision process, so pervasive in business, that is missing not only from the TE box graphic above but, it seems, from the whole BI mindset. 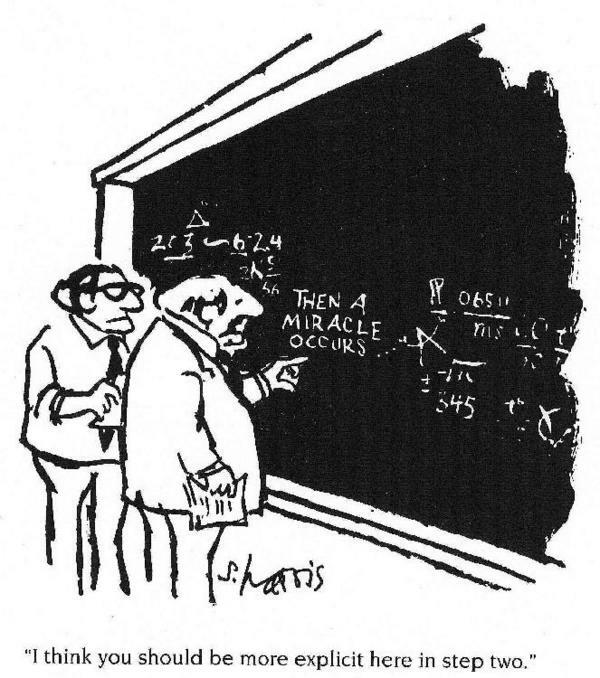 Just as there are complex formula either side of the crucial “step two” on the blackboard, so business intelligence suites, it seems, provide technical power either side of the “miracle” of human deliberative decision. What business intelligence suites (and knowledge management systems) seem to lack is any way to make the thinking behind core decision processes – the “step 2″ in moving from information to action – more explicit.